In Addendum: Climate Change Impacts in the United States (pp. 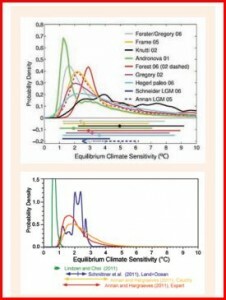 26-28), Michaels and his colleague Chip Knappenberger discuss those studies in greater detail and also illustrate with two graphs how the IPCC AR4 warming projections should be adjusted in light of more recent climate sensitivity research. Note that the ‘long, fat tail’ of high-end warming projections in AR4 is absent from projections based on more recent science. 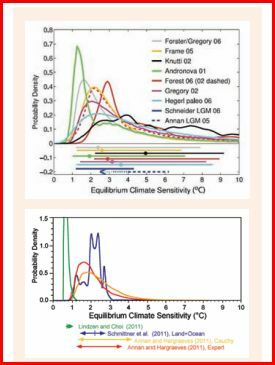 TOP: A collection of probability estimates of the climate sensitivity as presented in the IPCC AR4. The horizontal bars represent the 5 to 95 percent ranges, and the dots are the median estimate. BOTTOM: A collection of post-IPCC AR4 probability estimates of the climate sensitivity showing a lower mean and more constrained estimates of the uncertainty. The arrows below the graphic indicate the 5 to 95 percent conﬁdence bounds for each estimate along with the mean (vertical line) where available. Update (Jan. 29, 2013). I noticed yesterday (but neglected to mention) that there is no link to the Bernsten team’s sensitivity study in the Research Council of Norway’s press release. Now I know why. The ever-vigilant Anthony Watts reports that the study has not been peer reviewed. The press release should have mentioned this; it didn’t. 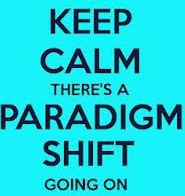 Indeed, it is shoddy to issue press releases about studies that have not passed peer review and have not been accepted for publication by a reputable journal. Bloggers too should abstain from commenting on studies they have not read with their own eyes. I have always followed that rule — until yesterday. Apologies. Never again.